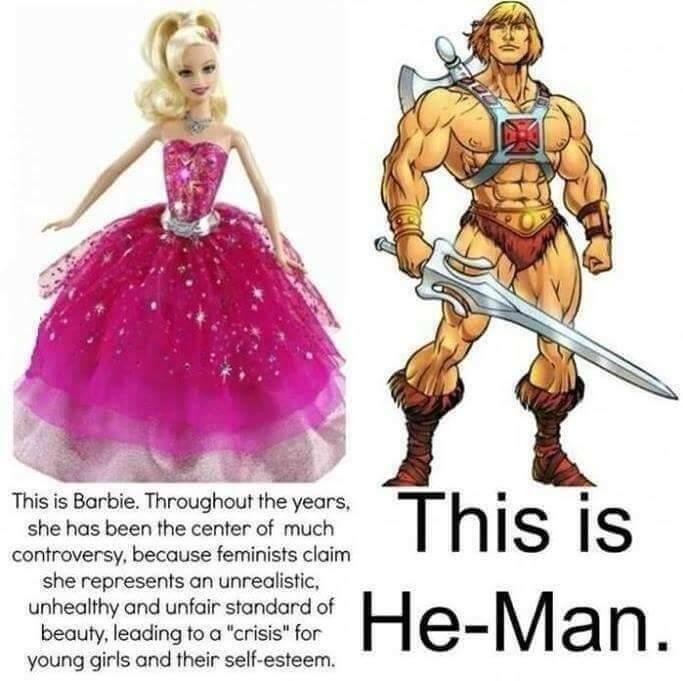 I saw a picture of Barbie and He-Man on Facebook this morning and it got me thinking. 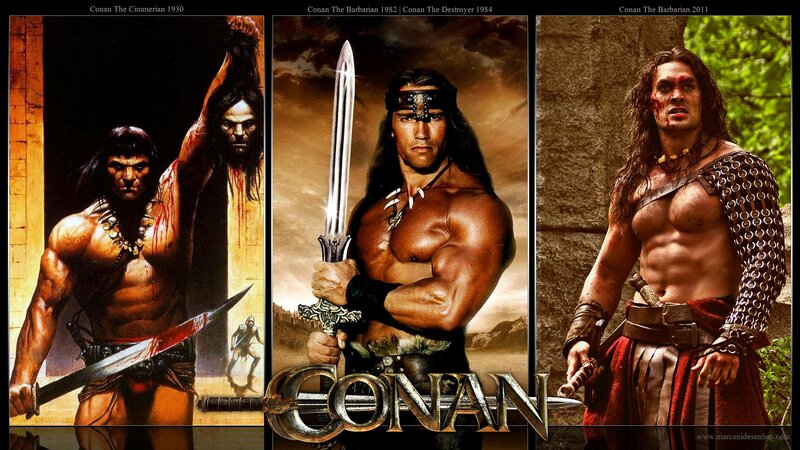 I grew up with influences like He-Man, The Incredible Hulk, and Conan in my life and I loved them. I wasn’t quite as much into He-Man, but the other two were definitely in the top two. Heavy influencers for me…so heavy that over 30 years later I can still pick up around 600lbs, yet my day job is that of a lead software developer and I’ve written over 70 books in fantasy, science fiction, and other genres, and I hold a masters, a bachelors, and an associates degree in varying fields. Inside jokes aside, I see what my kids watch today on TV and I have to wonder where they get their inspiration and role models from. A talking sponge? Goofie cartoons I can’t make any sense of with characteristic graphics? To be totally fair, I love where some cartoons like Sofia the First and the Barbie movies have gone for girls. Strong, intelligent, and capable young ladies. My daughter’s into Monster High too, and as bizarre as that can be, it has more of the same message. So what about the strong male role models? Well, there’s Transformers…but wait, those are robots. The sponge and his idiot starfish friend Patrick? Phineas and Ferb is entertaining, but it teaches my son more about getting away with things than taking responsibility. Star Wars Rebels, a recent show, seems to have some legs to it, but I’m biased towards sci-fi. And in Star Wars the big and physically powerful men are aliens. Why are we so afraid to show a large and muscular man? Why are they villainized and considered threatening? Today’s concept of a strong man is a metrosexual man that has leaned out to 7% bodyfat and weighs in around 135lbs. There’s no real strength there, just a desire to fit into fashionable skinny jeans and maybe get his chiseled 5 o clock shadow face on a magazine cover for 50 sexiest men in 2015. What’s that teach? Abuse yourself for the masses. Seek happiness by trying to convince others to look up to you. Women these days can be strong and self-sufficient, as well as beautiful and well rounded. Men? Men take a back seat and have to atone for years of gender-bias. Hell, these days the media would have us believe that men need to be more feminized and softened. If it hasn’t come across yet, I’m a huge proponent of equality and empowering women. My wife regularly busts my chops in every way she can (and she has found plenty, let me tell you!). However, making our wives, sisters, and daughters stronger does not have to come at the sacrifice of denigrating the male gender. The world is a diverse place, why can’t we embrace that and have all kinds portrayed so our children have more choices of what they want to become? Yes, our kids learn from us as parents, but we’re a constant in their life that they tend to ignore as much as possible. Cartoons and movies…now those are special. Those have impact, even if fleeting. I’m here to say that I still carry some of those fleeting moments with me, almost 4 decades later. Continuing the website rebuild project I’ve added a section on the bottom left. I forget what I called it, but it’s under my newsletter signup form. The content of this section is a single ad chosen randomly among the ads I have on file. So far I’ve got four, one for my wife, a couple of other authors, and another to a new website put up to showcase free reads on the Kindle. My plan? Millions of dollars in advertising revenue, of course! Okay, maybe not. In fact, I’m not charging a damn thing for this. Stupid? Maybe, but I don’t figure I can justify charging until I know if it does any good. So far the results are disappointing, but I am tracking the number of displays and number of clicks. Then, if things do eventually start working out, I may dig deeper into monetizing it. But how? Am I going to be one of THOSE guys that charges for ad space? Maybe…but probably not. I’d rather go with an affiliate account and spare my fellow starving writers. That and I have this annoying habit of trying to help people. Sure, my ulterior motive is that if they succeed I can ride their coat tails into greatness, but so far I remain firmly entrenched in the helping others mode. This experiment did get me thinking though. What other web pages can I build up to help myself and others? The http://www.readfantasy.org ad I added last night really got me thinking. Except that’s already been done now, so what else can I do? Happily taking ideas if anybody has them. And yes, I need to build up a website for Dawn Michelle too, but that’s going to take a little more time and effort. Meanwhile I’ve still got to write. Rise of the Serpent is coming very soon and I’m on chapter four of Out of the Dark, book two in the Dark Universe series. At this rate I should have Out of the Dark ready to go by mid to late March, as long as I can do my part and my editor and cover artist are available. I’m talking about my website. It’s been old, dusty, and unmaintained for far too long. Well after the last week of work, I’m happy to say that’s not the case anymore! Not only did I give it a complete overhaul, but I changed technologies to make it faster and more secure, and switched it from my old twitchy ISP to be hosted on my own server sitting a few feet behind me. Try it out and see what you think. ALL of my books are on there now (listed by series), as well as handy links for free books and audio books. My past newsletters are archived there, and there’s a direct feed from my blog. It’s almost like I knew what I was doing! But I can’t take all the credit. My wife, the lovely Dawn Michelle, provided a lot of assistance in picking colors and laying things out (and by a lot I mean damn near all of them – I can’t pick one decent color, let alone the half dozen or more used in a website). My beta testing team consisted of a wonderful group of writers and readers too lengthy to list – but I express my heartfelt appreciation to them all. Check it out, It’s www.booksbyjason.com. But wait, I mentioned multiple releases…what else have I got up my sleeve? Rise of the Serpent, book 2 in The Serpent’s War fantasy series. No, it’s not available just yet, but it will be very soon. I’ve got a soft date of Feb 15 from my editor and I’ve been actively working on cover art with one of my amazing cover artists. And now that I’ve hit a happy point with the website, it’s time to get back to writing! Dark Universe, here I come… I’ve been dreaming up all sorts of ideas to put into the sequel for Into the Dark. Now I get my chance to make it happen! But don’t worry, fans of Vitalis and Voidhawk, those are coming soon too. Thanks for the patience while the construction dust settles. Now it’s time for me to get back to work to get the books flowing again.